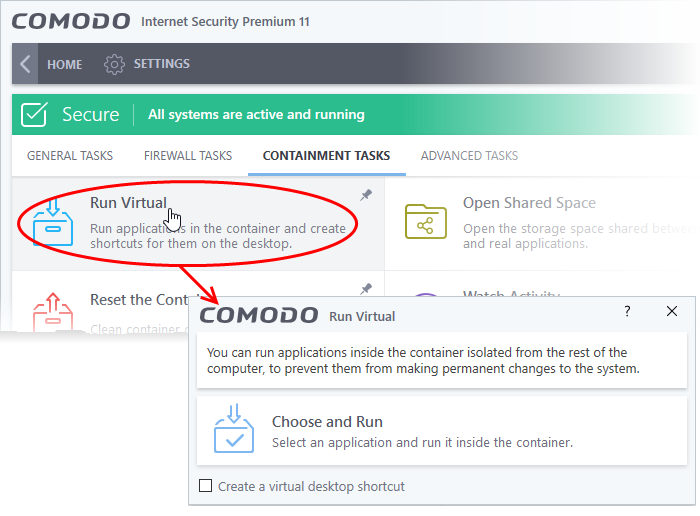 Comodo Internet Security allows you to run programs in containment on a 'one-off' basis. 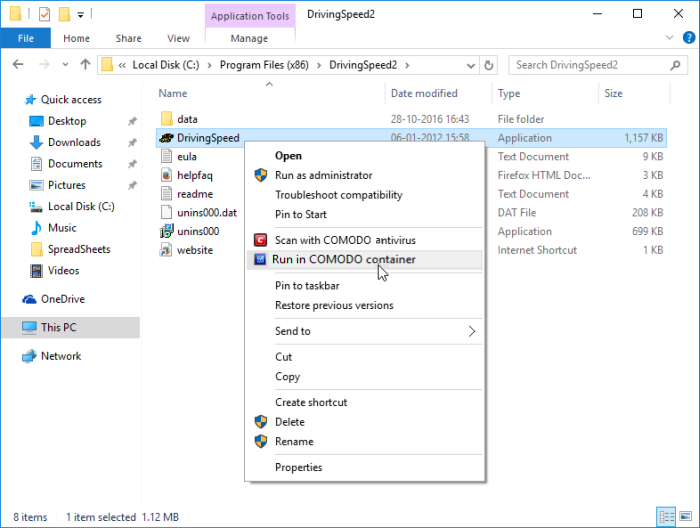 This is helpful to test the behavior of new programs you have downloaded or for applications that you are not sure about. This method will run the application in the container one -time only. On subsequent executions it will not run in the container. You need to create an auto- containment rule	if you want it to always run in the container. Note: If you wish to run an application in the container on a long-term/permanent basis then add the file to the Container. 1. Open the 'Tasks' interface by clicking 'Tasks' from the top left of the CIS home screen. 2. Click the 'Containment Tasks' tab. 4. Click 'Choose and Run' then browse to your application and click 'Open'. The contained application will run with a green border around it. 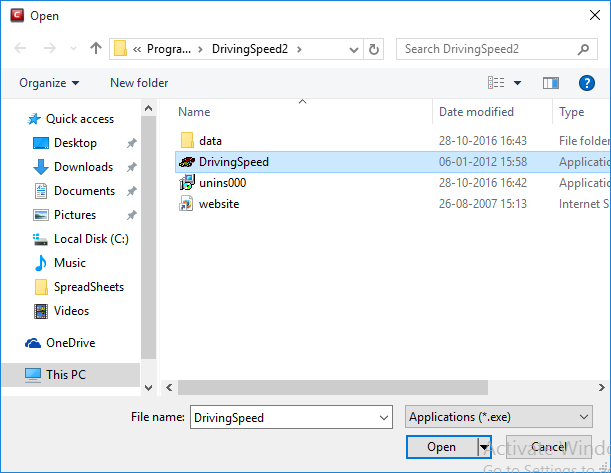 If you want to run the application in the container in future then enable 'Create a virtual desktop shortcut'. Clicking on a shortcut will start the browser inside the container. CIS displays a green border around programs running inside the contained environment ('Show highlight frame for contained applications' must be enabled in Containment Settings). Tip: Running a browser inside the container deletes all traces of your browsing activities. This includes your browsing history and cookies and offline data stored by the websites you visit. Virtualization protects your computer from anything malicious that is downloaded. 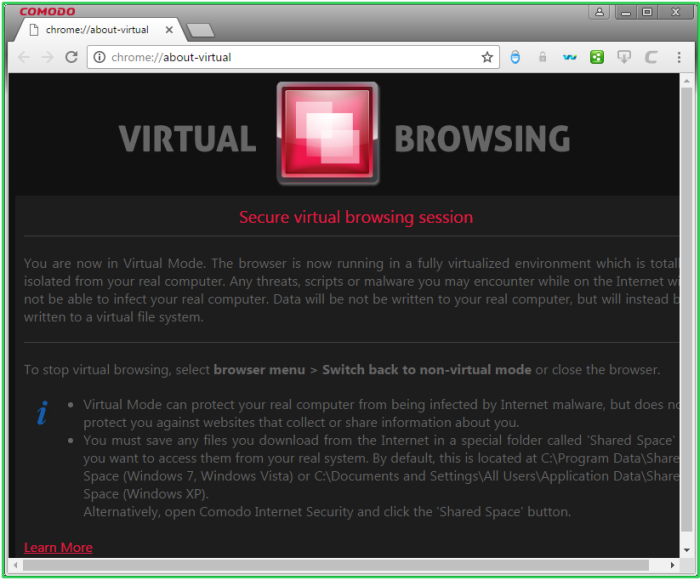 See The Virtual Desktop for more details. However, for visiting important shopping or banking websites, we recommend you use the Secure Shopping environment. Secure Shopping hides your browsing sessions from the rest of your computer and protects your data from any potentially hostile processes running on your computer. What's the difference between Secure Shopping and the Virtual Desktop/Virtualization? The two systems are intended for opposite use cases. The virtual desktop/virtualization protects your computer by isolating potentially malicious applications and processes inside a container. Secure Shopping is the reverse of this. It protects the application itself(e.g. browser) from any potentially malicious applications running on your computer. With Secure Shopping, your secure banking sessions are totally sealed off from the rest of your computer. See Comodo Secure Shopping for more details.